1. Buying a suit that does not fit. Ok, forget what I just said. This is, the most important. For all of our articles on wearing suits where the fit starts with snug shoulders, and works its way down from there, a loosely fitting, baggy suit will have you looking plain sloppy. And honestly, the next time you’re at an interview, a business meeting, a formal dinner dance or any other event that would summon you to strut a suit, do you really want to look like Mr. Barkley? I think not. Enough said. 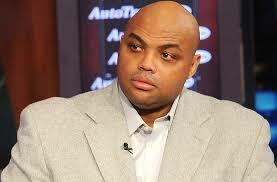 Avoid wearing baggy suits, unless you want to dress like Sir Charles! 2. Mismatching shoe and belt colors. If you claim you dress well, act like it. If you are wearing a brown belt with a grey or navy blue suit, please wear brown shoes. For a black suit, you should always be wearing black shoes, and by association, a black belt. 3. Mismatched socks and trousers. As I’ve mentioned in previous articles, if you are dressing conservatively, you want the color of your socks to match those of your trousers. 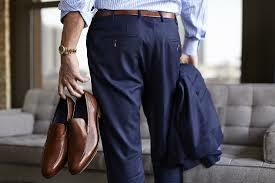 If you dress with more flair, have your socks match the colors of your shirt, ties or pocket squares. Therefore, with a grey or navy blue suit, avoid black socks! When not wearing black pants, wear anything but black socks! Jackets should never be fully buttoned unless double breasted. With two button jackets, button the top button, and with three button jackets, button the middle one. The top button of a two button suit should be fastened! With vests, generally leave the lowest button undone. 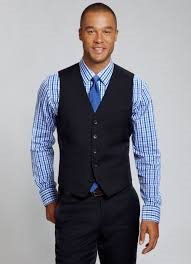 If you dress sharp enough to wear a vest, its best to leave the last button undone! With a shirt button, all buttons should be done, including the collar (assuming, of course, you are wearing a full fledged suit with a tie). This includes cuffs, collars in the case of button downs, and the small buttons halfway up your forearm (which serve a functional purpose to allow you breathing room when you are trying to roll your sleeves up).